This gorgeous film uses Paul Nipkow's disc as a rotary shutter inside a super-8 camera. Sequences were shot out the filmmaker's window and then blown up to 16mm. 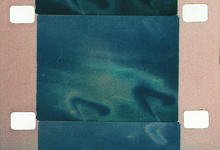 Positive and negative images change throughout the film by dissolving them and by enlarging the blow up.